Known affectionately by locals as 'The Pink Palace,' the Hamilton Princess & Beach Club, A Fairmont Managed Hotel is a treasured destination where history meets modern sensibility. This urban oasis opened in January 1885 and has been a popular resort locale ever since. Built in honor of Princess Louise after her 1883 visit to Bermuda, the hotel is still known as a delightful getaway for travelers to relax on this British-ruled island. One such traveler, Mark Twain, happily signed autographs while smoking cigars during his stays at the Hamilton Princess & Beach Club. 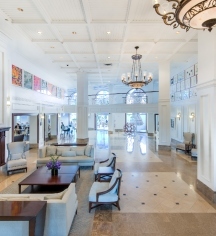 This luxury historic hotel features over 400 renovated guestrooms and suites with deluxe amenities and breathtaking views of the grounds, the ocean, and Bermuda’s gorgeous pink sand beaches. Guests of Fairmont Gold and Fairmont President’s Club can enjoy complimentary continental breakfast, hors d’oeuvres, and complimentary WiFi during their stay at the Hamilton Princess & Beach Club. The Hamilton Princess & Beach Club has an abundance of activities for guests both on-site and in the surrounding areas of the island. The resort’s 1609 Bar and Restaurant offers a casual open-air dining experience, while Crown & Anchor features delicious meals with a sea view and a bar that stays open until midnight. The exclusive Princess Beach Club is located on one of the island’s most gorgeous spots, with tranquil, clear water for swimming and a magnificent beach for lounging. The hotel has collaborated with lifestyle and well-being brand Exhale to build a spa and fitness center that offers exercise classes, brand-new fitness equipment by Technogym, and luxurious spa treatments by the ocean. Guests of the Hamilton Princess & Beach Club will have no shortage of activities during their stay in Bermuda. The resort offers whale watching, stand-up paddle boarding excursions, as well as guided tours through the resort’s art collections. 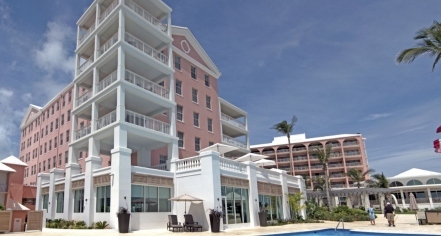 While guests do not need to leave the complex to have a wonderful time in Bermuda, the hotel does offer proximity to the Hamilton city center for those looking to explore the local culture. Business travelers will appreciate the hotel’s closeness to downtown Hamilton’s business district, and leisure travelers will appreciate the relaxing atmosphere of the island. Mark Twain was a regular at the Hamilton Princess & Beach Club and he loved to smoke cigars on the veranda while signing autographs and reciting poetry to adoring fans. Airport Transportation: 24-hour airport shuttle service is available on request for a $65 fee per person. Contact the property in advance to make arrangements. Pet Policy: $25.00 per pet, per night. Known affectionately by locals as 'The Pink Palace,' the Hamilton Princess & Beach Club, A Fairmont Managed Hotel is a treasured destination where history meets modern sensibility. This urban oasis opened in January 1885 and has been a popular resort locale ever since. Learn more about the History of Hamilton Princess & Beach Club, A Fairmont Managed Hotel .